Today, I am excited to be celebrating 1 year of blogging! I have enjoyed so many memorable experiences this past year and love the connections I have made with wonderful writers and readers. I look forward to sharing many more books, deals, and giveaways! To celebrate this special blogging occasion, I am granting book wishes! We all have books on our wish list and I thought it would be fun to make a few of those wishes come true! To enter, leave a comment below with the title of the book that is at the very top of your book wish list. Be sure to include your email address! Please select a book that is currently available or releasing this month. 3 winners will have their book wish come true! This giveaway ends Thursday, July 17 at midnight CST. Three winners will be drawn and announced on Friday, July 18. Good luck and may your book wish come true!! Happy Blogaversary! I recently just had my 1 year, as well! I am still wishing for Landline by Rainbow Rowell! Happy, Happy 1st year! You have done a great job. Your reviews have been superb! Here is to many, many more words that flow from your mind and heart. You have a real knack and it shows that you are doing what you love. My book wish would be The Thief. I am passing your blog on to friends. Happy Blogaversary……I really enjoy your blog! So sweet of you to offer a book……my wish is for Bridge to Haven by Francine Rivers. I follow you via e mail. Happy Bolgaversary!! I am glad you started your blog as as I am a follower and enjoy it! I am a huge fan of Jody Hedlund but have never read “Unending Devotion”. Thanks for the opportunity!! Happy 1st Blogaversary! One book that I’d really like to have is Dangerous Passage (Southern Crimes Book #1) by Lisa Harris. I have the second book, but I want to read them in order. Thank you for offering a change to get this book. I am a follower and I tweeted about your post. Great 1 year blogaversary celebration going on over at Buzzing About Books with giveaway! 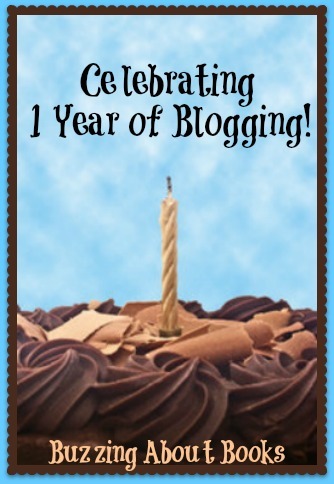 Happy 1 year blogaversary! Great giveaway idea. I reblogged/shared on my blog and I am a follower. I think I would like to request A Moment in Time by Tracie Peterson as the book I would want to win. I ‘googled’ shared about your 1 year anniversary! I follow, follow, follow your blog! I would love to read the latest book of MaryLu Tyndall’s…or Tamara Alexanders….or Robin Hatchers! I cheated… I’m in Nicaragua (we’re missionaries but have a stateside little spot) and have eaten gallo pinto (rice/beans) for 60 days… I’m not responsible for not thinking clearly on following the rules! Gorget to say , I follow your blog . Congratulations for completing one year of blogging. I heard about your blog from Brittany at Britt Reads Fiction and just became a follower. There are so many books I really want to read. I’ll put Yankee in Atlanta by Jocelyn Green at the top of this wish list. Thanks for giving away books! thank you so much for the opportunity to enter your giveaway! I love giveaways!! I have already gotten the two free ebooks, Finding Jeena and The Other Daughter, and they both are AWESOME!! Thanks so much!! I already am subscribed to Buzzing about Books and I liked, joined, tweeked, twittered, shared, pinned and even Googled all that I could!! And delighted that I could help you spread the word!! Congratulations on your 1 Year of blogging ….I really truly enjoy it, as you do a great job!! Always interesting…….I would love to win any of the books BUT the one I would most love would be Dangerous Passage of the Southern Crimes Series, Book #1 by Lisa Harris, one fantastic suspense writer!! Thanks again and may God continue His Blessings on you dear friend. Congrats on your first year of blogging!! “To Whisper Her Name” by Tamera Alexander is one of the many books on my wish list – thanks for the giveaway opportunity!! I am already a subscriber and have shared this post on Facebook!! My book wish is When I Fall in Love by Susan May Warren. [I recently got the second book of the series for free on my Nook, then bought and read the first. I can’t wait to read the third!] I also follow your blog and I shared a link on Facebook. by Colleen Coble would be a book I’d enjoy reading.. Congratulations!!! What a great milestone for you. On top of my wish list at this moment is Northkill by JM Hochstetler. I have been following via email for awhile now. Sarah Dessen’s new one, The Moon and More. Can’t go wrong with her! 🙂 I do follow you, I will share this, and congrats on one year of blogging! Keep writing! Your blog is a wonderful addition to the blogosphere! Congrats on one year!!! I just found y’all the other day so I’m a pretty new follower but I’m enjoying your blog so far!I’d love to win a copy of Yankee in Atlanta by Jocelyn Green! My comment didn’t show up. If this double posts you can delete one. Doesn’t it seem as though the year flew by? Great job on your blog by the way! One of the books I’d love to have is, “Stuck Together” by Mary Connealy. I love her books! Happy Blogaversary! What a fun contest. One of the books I would love is With Every Breath by Elizabeth Camden. It comes out July 29th. Thank you for the generous giveaway! I’d love to win Rise and Shine by Sandra D. Bricker. God bless and happy blogaversary! Congratulations!! Thank you for the giveaway to celebrate 🙂 Meant To Be Mine by Becky Wade is currently at the top of my TBR list. I follow your Blog and twitted giveaway. Congratulations on your milestone and thanks for celebrating with us! Wow–what a fun giveaway. At the top of my wishlist is Anomaly by Krista McGee. I am a follower of your blog by email. Thanks again!